Hello lovelies, how are you all? Hope you’re all having a good week! I’ve been rushed off my feet recently, I have three deadlines for my uni work this week (one’s already gone, yay!) so I’ve been trying to get all my work together (I’m a bit of a last minute person, so deadline weeks are always horrific!). Anyway, this is a comfy outfit that I’ve been wearing a quite a bit recently. 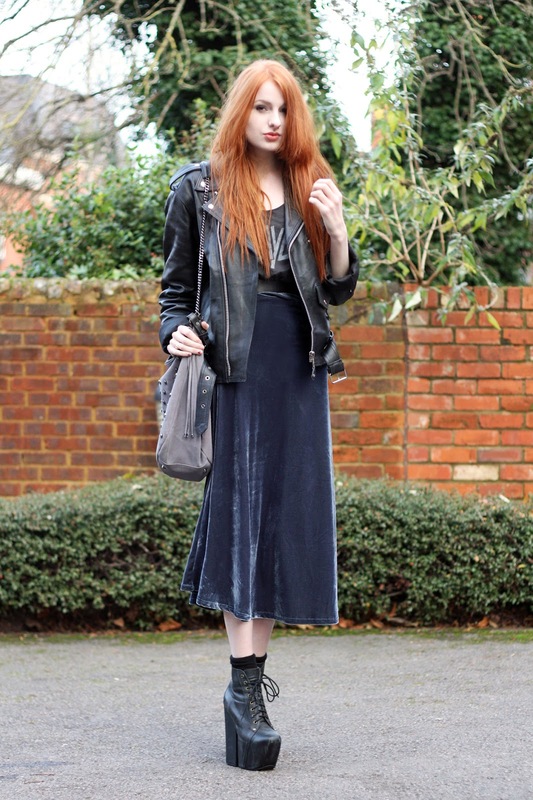 You might have noticed that I love velvet skirts (I think I have seven?! ), so this midi skirt is a slightly more winter-appropriate version of my favorite piece :3. I threw on my heavy leather biker jacket to help keep warm- it blocks out the wind so well, which is great because the wind in England has reached new levels of ridiculousness (at least round where I live!). Other parts of the country are getting snow already, I’m so jealous, because all we have here is just the coldness, wah :(. Oooh, and I have a new bag! 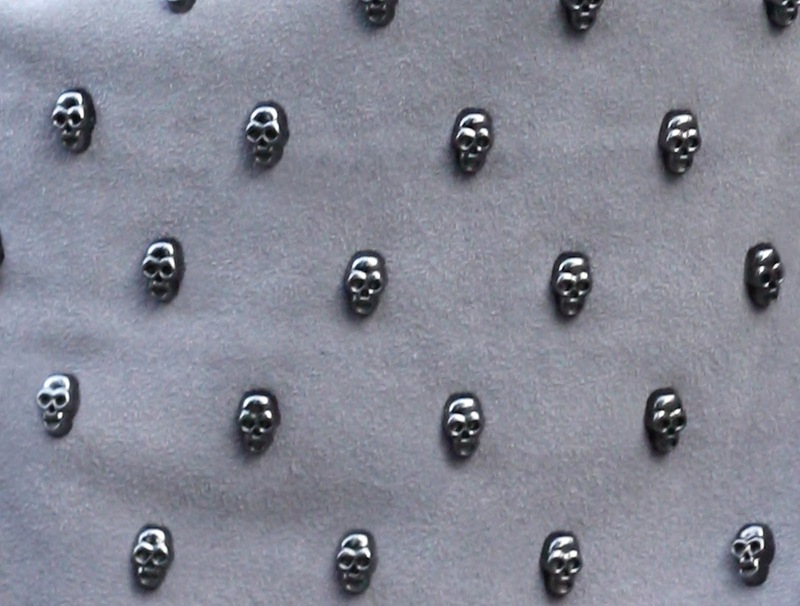 It’s from Pauls Boutique, and it’s beyond gorgeous- grey suede with metal skull studs. When it came in the post I literally spent about ten minutes cooing and stroking it (usually only shoes and kittens inspire such a reaction from me). It’s definitely the best quality bag I’ve ever had, and I can see it being a firm favourite in my wardrobe for a long time ^.^. Previous Post If you go, I will surely die. This is me typing slayer. But of course you know this, clearly. heyyy a paul's boutique bag that i like, what is this?! You look gorgeous sweetie 🙂 Love it <3 the skirt is perfect on you!! love the bag, so much nicer than the typical neon and chains/badged ones! awesome outfit! You look so awesome 🙂 really do love your style! That bag is amazing. I love the mixture of soft and hard textures in this outfit. Really nice! You are relentlessly gorgeous Ms. Olivia Emily- I would LOVE to see you rock more vintage dresses. Love how you style things- this bag is perfect for you. I love the skull details. Have a great week!